Life skills stations are an important tool for many memory care communities. They are interactive environments that recreate familiar situations from the past such as an office space or a nursery. 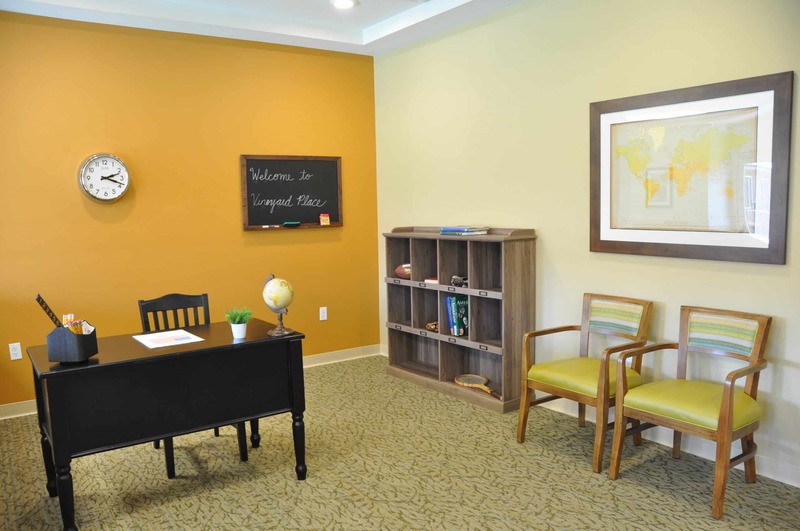 The goal is to elicit long-term memories from one’s past, and each station is purposefully designed to spark memories, create moments of happiness, and help caregivers learn more about each resident. We’ve shared the benefits of life skills stations below, along with our recommendations on designing and utilizing them. What are the Benefits of Life Skills Stations? Life skills stations offer unique benefits to many dementia residents including improved health, recollection, communication and relationships with caregivers or family members. As resident engages as the life skills station, the caregiver or family member learns more about the resident, such as his/her past and likes/dislikes. In today’s focus on person-centered care, this helps the caregiver better know and understand the resident, and develop more specialized care for that individual. Utilizing life skills stations also encourages residents to exercise their cognitive abilities and practice communication skills with others at the station. They can also help residents maintain muscle flexibility by creating a space for light movements. Most importantly, life skills stations can help reduce frustration and restlessness by focusing on familiar activities. There are many types of life skills stations that can be created for residents. However, one thing to keep in mind when designing a skills station is that many residents have trouble recalling more recent events and collecting their thoughts around them. That’s why most life skills stations focus on experiences from their long-term memory. Some examples of stations include a vanity, handyman stations, a nursery, kitchens, patio spaces, antique memorabilia and more. At Warner Design Associates, we try to create a highly visible and accessible life skills station that connects people to their past, and prompts interaction with their caregivers or others. Our goal is to create a place that fosters curiosity and joy. One thing we take into consideration when designing a life skills station is the generational differences between many of the residents. When designing a life skills station, we try to make the environment similar to what one would have recalled from their past. For example, if most residents grew up during the World War II or post war era, we try to consider the types of clothes, workspaces, utensils, wallpaper, and houseware items that would have been available during that time period. We want the environment to be designed as realistic and accurate as possible since it can significantly improve the memory connection, and help caregivers or family members learn more about that individual’s past. That’s also one of the reasons why we recommend updating life skills stations with each new generation of residents. Many senior living communities today are focusing their caregiving approach on “person-centered care”, which focuses on each resident as an individual with unique preferences, values, and backgrounds. This approach can be applied to life skills stations by creating an environment unique to the resident or group of residents with similar interests. For example, knowing that a resident is a retired firefighter will allow the community to design a life skills station with relevant items to engage that individual. One thing to keep in mind is that life skills stations may not be obvious to residents, and therefore may not be utilized unless prompted. We recommend that caregivers be educated on the benefits and uses of life skills stations, and how it can help them apply a person-centered care approach. Caregivers can then actively encourage the use of these stations that may otherwise be overlooked. If you have any questions regarding the design and implementation of life skills stations in memory care communities, our team is happy to help. Feel free to contact us and check out our portfolio here.